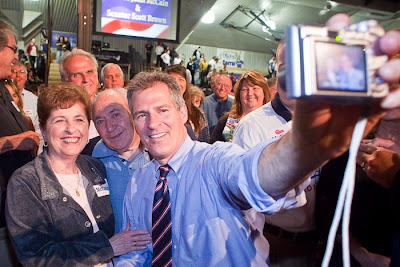 Scott Brown, the newest US Senator in Washington, the Republican who shocked the Democratic establishment when he won Teddy Kennedy’s old seat (even though the Democrats arguably beat themselves with a thoroughly inept campaign), is a hot commodity right now. John McCain, who is in the toughest primary battle of his political life brought Brown to Phoenix Friday to campaign for him. The crowd was treated to the usual McCain stump speech and then Brown spent a few minutes mingling with folks before being ushered to one on one interviews with local TV stations. McCain’s opponent, JD Hayworth, is an arch conservative who has courted the Tea Party movement. Apparently the love is not being returned since both Sarah Palin and Brown are campaigning for McCain and Tea Party leaders in Arizona have indicated that they won’t endorse either man. There are more photos from today’s campaign event in my PhotoShelter archive.